The Final Toy Story 4 trailer is here! Wow. The latest trailer for Toy Story 4 is quite something. Humor is largely absent, unlike the previous ones we’ve seen. In fact, the overall tone of this trailer is dark and somewhat foreboding. The very subdued and shadowy lighting is mostly responsible, along with thematic hints of trouble. Woody and the rest of Andy’s toys all make an appearance, along with Bo Peep, Forky, and some creepy new additions. The poster below clues us in to how prominent of a role each character will play. Woody, Buzz, Bo, and Forky are a given, along with Ducky and Bunny. But on the far left, we see three new additions. There’s a doll, named Gabby Gabby, and ventriloquist dummies. UPDATE: Keanu Reeves’ mystery role has also been revealed. He’ll be lending his voice to Duke Caboom, a 1970s toy inspired by “Canada’s greatest stuntman.” He’s the little guy flying near the logo. Sinister! I don’t like Gabby Gabby at all. And judging from her behavior in the trailer, I’m sure I’m not the only one. As to the plot, Forky is introduced as Bonnie’s new toy, and he is resistant to his new identity. So Woody goes after him, and in his adventure to bring Forky back home, finds Bo Peep. And she scoffs at his dearly held beliefs about where toys rightfully belong – with children. This trailer is impressive, mostly because plenty of people were so underwhelmed with the first bit of previews. What I’m absolutely sure of is that this film will look gorgeous. And the vibe I’m getting from the story is one that’s wacky, dramatic, and emotional. Josh Cooley has also let us know that the film clocks in at 89 minutes, the standard for most animated films. But if this trailer is any indication, the fourth installment to this beloved series will be anything but. Toy Story 4 premieres on June 21st, 2019. Yesterday’s Disney Shareholders meeting revealed some new details for Pixar’s upcoming Toy Story 4. The film has already generated lots of excitement for the reappearance of Bo Peep, also clad in pantaloons and a much more active heroine in the newest installment. Now we have more of a plot shaping around these old and new characters. Toy Story 4… Bonnie makes Forky at school, Woody introduces him to everyone. They go on a road trip in a RV, Forky escapes because he wants to be a spork not a toy. Woody and Buzz go after him. Woody spots Bo in an anqoue ship, he goes in, creepy doll in baby carriage says he can’t leave and sends super creepy ventriloquist dummies after Woody and Bo. No very much in Rey the scavenger mode; taking control of situation. Woody seems to be torn between making Bonnie happy as a toy and staying with Bo at carnival (? ): Woody explains to Forky in a scene walking down road that he can bring happiness to Bonnie; he’s her favorite to; that’s what gives him life. Buzz and others go to bring Woody back. Woody has a decision to make: stay with Bonnie or stay with Bo. Is there a happy medium? Can Bo become a cherished new addition to Bonnie’s room? Or is she, like Forky, not content to be a toy the way Woody insists everyone to be? Toy Story 4 was originally described as a love story between Woody and Bo. Now it seems like that storyline is being further explored with a much more weighty angle. While Woody has always been adamant that his place is with a kid, he’s also missed Bo Peep a great deal. One of the most subtly heart wrenching moments in Toy Story 3 is the sadness in his face and voice when Rex mentions her name. Could she upend his entire philosophy? And then there’s Forky. He, like Buzz in the first movie, doesn’t want to be a toy, doesn’t even want to be sentient. How will his story play out here? It’s remarkable that Pixar could create a whole universe from the simple concept that children wonder about or believe in: their toys coming to life. An expanding universe filled with beloved characters and thought provoking questions. June 21st just can’t get here fast enough! Domee Shi is now an Oscar winner! At the Academy Awards last night, Shi won gold for “Bao” in the Best Animated Short category. She and producer Becky Neiman-Cobb took the stage to accept the award for Pixar’s sole win of the night. (Many congratulations to the cast and crew of Spider-Man: Into the Spiderverse for winning Best Animated Feature!) There was also a sweet hug between Shi and fellow Pixarian/nominee, Trevor Jimenez before she made her way to the podium. Shi also thanked Pete Docter for believing in her weirdness and giving her a voice at the studio. This was definitely the most emotional part of the night for me. Becky Neiman-Cobb thanked her own bao at home, Lucy, who was born while the short was in production. Domee’s win is a huge leap forward for Pixar’s efforts to be more inclusive. They are walking the walk. Domee mentioned the other two woman directors of Pixar shorts backstage following her historic win. Hopefully this is only the first Oscar win for Domee Shi! Congratulations to her, Becky Neiman-Cobb, and the entire crew for their phenomenal work on this short film. Pixar’s second entry in their new SparkSports program continues the studio’s tradition of being dialogue free. You might be tempted to compare it to their 2008 feature, Wall-E, but “Smash and Grab” is an entirely different film. The short’s title refers to the names of the two robots, who work diligently in the engine room of a sleek and futuristic locomotive. Smash, the taller of the two, has hammer arms, which he uses to smash rocks, while the short and stocky Grab, just has hands to toss the rocks into the furnace. The two are confined to this room, until Smash sees the wider world outside. The robots out there move freely, unlike these two companions, who are bound to their station by a long, fluorescent green rope. Smash is startled to see these robots, but he can see himself and Grab out there, too. And so begins their great escape. “Smash and Grab” was actually first unveiled in May of 2017 at SIGGRAPH. Back then we didn’t have any more details on the short. Now that the whole thing has been released, it’s much better than what we might have imagined! For one thing, this is a story about defying the status quo. Smash and Grab want more out of life than to toil away at an unfulfilling job, a struggle a lot of human beings and millennials especially can relate too. It’s often a wistful aspiration, because a lot of the time, people just can’t afford to leave their jobs, even if they do hate them. So it’s quite easy to root for Smash and Grab to live the lives they want, rather than be stuck in that cavernous engine room forever. Pixar have long personified inanimate objects and animals, just like many other animation studios. But making robots more personable is a tricky task. They can be nefarious, like the HAL 3000 in Stanley Kubrick’s 2001: A Space Odyssey; or friendly and humorous like Star Wars‘ C-3PO and R2D2. But rarely, if ever, are robots soulful. Smash and Grab are, just like Wall-E. I can believe they have hearts beating underneath their cold, metal exteriors. Their longing is palpable as well. The stakes are also high. There’s even a heart wrenching moment in the short that’ll make you gasp, if you’re like me. And that’s to say nothing of the short’s stunning visual poetry. In the engine room, the rocks glow blue, as if embedded with crystals. Much of the short takes place at dusk, in the red-orange afterglow of the sunset. The lighting has a burnished gleam which reflects nicely on the robots and other surfaces. Take a look at the sea of pillowy soft clouds in the image above; the texture alone is amazing. The designs are impressive too, both of the robots and the train. (Maybe if more of them looked like that in our world, I’d be enthusiastic about public transit). “Smash and Grab” was directed by Brain Larsen, a longtime story supervisor at Pixar. To see more of the short, check out the filmmakers and behind the scenes videos. 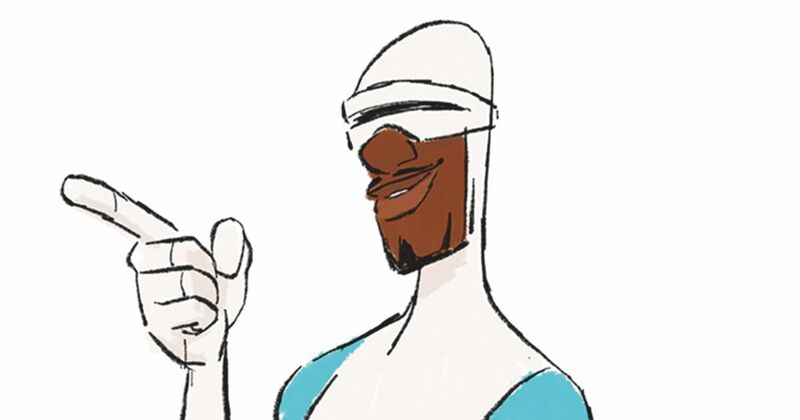 “The Coolest Guy in Show Business” on the Incredibles 2 Blu-Ray and DVD shines a spotlight on one of the film’s stars, Samuel L. Jackson. The actor discusses his childhood in Chattanooga, Tennessee, where segregation was strictly enforced. Jackson grew up with a love of comic books which predicted the future to him. Ordinary people today resemble those superheroes with their brightly colored hair and wild outfits. To Jackson, the world was limited, but the world of comics represented unlimited possibility. He also discusses how his grandfather molded him into a storyteller. With a vivid imagination, Jackson was able to make up plenty of stories while playing a multitude of roles. His gifts as a storyteller make him right at home at Pixar! Although the world has changed a lot since Jackson came of age, so much remains the same. Racism particularly is a blight that is largely ignored or barely addressed by leaders in public office. And so often, regular people dismiss it as a relic of the past, or something that must be blatant and vicious in order for anyone to pay attention to it. Segregation may no longer be acceptable in some parts of the country, but America in 2019 is still limited. And this is why stories exist; to remind us that multifaceted experiences from people of all races matter. That Samuel L. Jackson defied the limits and expectations of a racist society to become a celebrated actor – and superhero! – is what every black child deserves. This Black History Month and throughout the year, we encourage you to celebrate the achievements of black people in history and in our own communities. Be sure to uplift the black children in your life too. Listen to these stories. Last night’s Super Bowl gifted us with a Toy Story 4 commercial. Some viewers (myself included) were probably surprised to see this clip rather than an actual trailer. Bo Peep and the new twitter stars Ducky and Bunny make an appearance. I’m also left wondering if this is a scene in the actual movie, or just a fun little promo clip. Nevertheless, it is very funny and no doubt is increasing the anticipation for Toy Story 4. It seems like we’ve been spoiled with lots of Toy Story 4 content lately! With the film less than five months away, things are wrapping up. Tom Hanks and Tim Allen, along with new cast addition Tony Hale (Forky) have posted photos to their respective twitter accounts with the rest of the crew about their final days recording lines. It’s a little bittersweet! Finished my Buzz for Toy Story 4 today and it got emotional. Wonderful full body story. You are all going to love the work this incredible team at Pixar created. We are all going to love this story….man its got everything. What a momentous occasion this is. After three pitch perfect films, Toy Story 4 will be the last adventure we have with Woody and the gang. Still anticipating the film, but also don’t want this series to end! 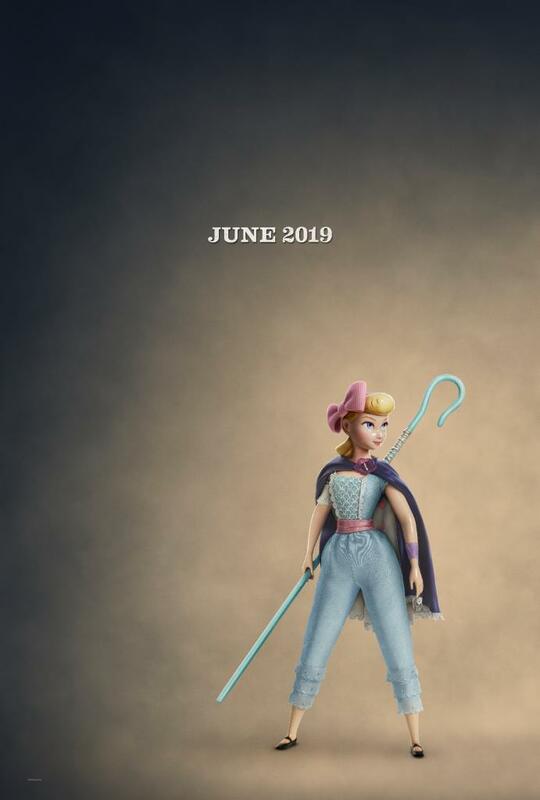 Our first official look at Bo Peep in Toy Story 4 is here! Her iconic pink and white polka dot dress with the matching bonnet has indeed been swapped out for the blue pantalettes we first saw from a blog post speculating about her appearance. This little 11 second teaser shows us so much. For one thing, Bo isn’t so fragile and stationary anymore. She actually moves. One of the reasons she had such a small role in Toy Story 2 was because her porcelain figurine couldn’t have gallavanted around the Tri-County area with the rest of Andy’s gang. But filmmakers have solved that problem this time around. Can’t tell if she’s still made of porcelain, but she is wearing a pair of strappy high heels! Maybe this means that little Bo Peep has lost her sheep permanently? Now she wields her long staff in an entirely different way, and swings from it and into the screen. Now that we have confirmation of Bo’s role in the film, we can only guess about what other surprises are in store! Bo Peep may have a new look, but I hope she’s still the sweet and lovely character she always was, even if she’s a lot tougher and active. In this character poster, she’s wearing flat shoes along with a cape! I didn’t think I’d love her redesign so much! Do you guys love it too? How excited are you for June 19th?! Update: EW has an exclusive description of Bo Peep from director Josh Cooley. Apparently, Bo and Woody have different ideas about what it means to be a toy. That seems to mirror the brief conflict between Woody and Jessie in the second movie. Can’t be sure just yet what Bo thinks it means to be a toy, but we are eagerly waiting to find out. A new Toy Story game from Big Fish will be released this spring, just in time for the latest film. Described as a match-3 puzzle game, the most exciting thing about it is the inclusion of Bo Peep. She’s still wearing her iconic pink and white polka dot dress with matching pink bonnet, but her design has been updated. It’s safe to assume that this is her final look in Toy Story 4. (Her clothes may be different however, as we found out a few weeks ago). I feel a little nostalgic seeing the three of them like this. The film is still four months away, but we’re already getting lots of glimpses at our favorite characters together again. Toy Story Drop! is just the latest game for the franchise – fans even have the chance to be an insider with exclusive games and giveaways. Will you be playing Toy Story Drop!? Let us know here or on Twitter.